After a glorious springlike weekend, once again I woke up to another snowstorm. Weather forecast was 3" to 6" of snow, but it's clear I have more than 6" of snow. I probably got 8" at least. As an artist, I'm trained to look at the world in a different way, to see beauty and wonder in the most mundane way. 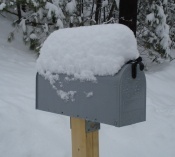 While getting my mail, I stood there looking at my mailbox, which had this lovely cap of snow. I took several pictures and here how it looks with it's snowy cap. That brings up another story involving my mailbox. Living out in the country has it's own challenges. We have a joke in my town that you either live on ledge rock or on swampland. I happened to live on a rock pile and it is so rocky, if you try to dig into the ground, you pull out more rock than soil. My first year in the town I currently live in, I tried to install my first mailbox on a post. Trying to find a spot that was all soil was almost impossible, so I ended up putting my mailbox next to a culvert. For 4 years, the mailbox stood there, getting a little more tilted yearly. Finally, the mailbox fell off one day. Took a few weeks and a new cordless drill to reinstall a new mailbox. That held up till the spring, where the maibox and post drifted almost a foot back, and it was either falling into the culvert every time I want to get my mail. That was not something I was looking forward to. I decided it was time to relocate my mailbox and post. It got moved about 50 feet downhill, and again, it was an impossible task to find a rock-free area to put post in. I sort of jury-rigged post and put a pile of rocks at the base for stablity. You do what you can. Almost a year later, the mailbox fell off again. This time, I knew I had to do something different. My father suggested I get a steel wheel hub, put a wood post on hub and mount mailbox on the wood post. I went to a junk car lot, which happened to be a "green" lot and a lot cleaner than I expected. Found a wheel hub, hauled that heavy sucker home, wired a steel post mounting onto the hub, nailed two 2 x 4 lumber together to make a post, put wood into the wheel post mounting, installed the mailbox onto the wood post and voila, I have my first freestanding mailbox that I can move around as needed. Hopefully the mailbox will never fall off! The things I have to do just to get my mail.